A few months ago, I gave a workshop at Harvard University's Innovation Lab entitled “UX Design - An Introduction." The workshop was a good introductory forum for anyone interested in general UX principles and/or getting a better understanding for the process, inputs and deliverables …associated with creating a digital experience - a site, app, etc. 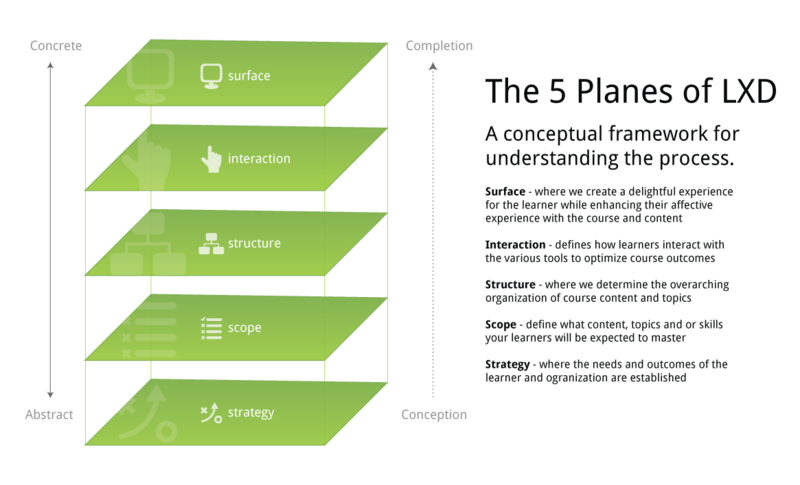 I utilized Jesse Garrett’s Planes of UX as a framework for taking people through this process. Although Jesse’s framework is hallowed among much of the UX world who are building digital experiences, I wanted to try and reconcile the planes and framework to better articulate the process for creating online learning experiences. Strategy - Define the needs and goals of both the learners and organization. Ultimately, the goals of a typical learner is to increase their knowledge, learn a new skill, increase motivation and confidence in a particular area. For the organization, the ultimate goal would be to effect and/or change behavior of the learner and increase their value and efficiencies to the organization. Scope - This is where all the inputs required are realized in order to develop a learning experience. This includes objectives, topics, activities, methodologies, etc. Once you have some of these inputs determined, you can start to better define the content and functional requirements needed for the learning experience in order to reach your objectives. Structure - Once you’ve solidified your objectives and requirements, you need to determine how those requirements will be structured. This is where we start to define the taxonomy and flow of the experience - what is the structure of topics, logistics, activities, assessments, etc. and how do they all relate to and build on each other? Both in user experience and learning experience design, this relates directly to information architecture. Interaction - This is where the tangible learning experience starts to take shape in the form of creating models of how learners will interact with content. 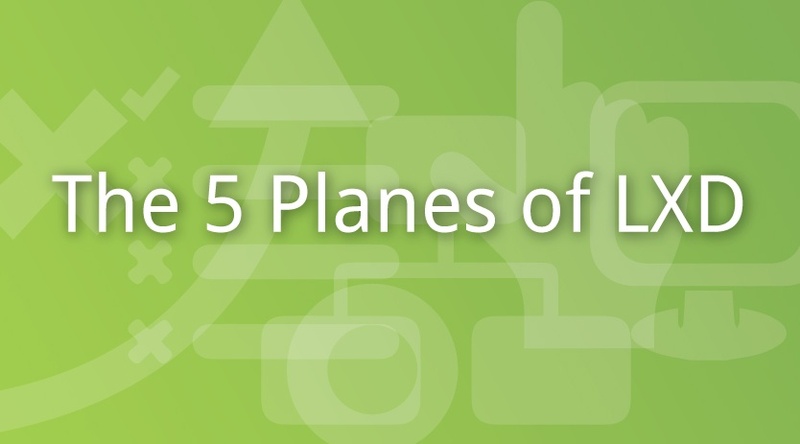 At this plane, the problem we’re trying to solve is what are the specific learning objects that will comprise the interaction e.g., (video lectures, text-based content, infographics, etc.) and what is their ideal sequence given the course objectives. For example, a traditional didactic course might front load lecture and other informational content and end with a summative assessment whereas a situated learning approach could begin with a video based story and or problem to solve and situate the didactic content within. Surface - This is where we tangibly define the specific modes of interaction which are primarily derived by the content type. This last plane is built upon the previous planes and steps-presenting a cohesive, delightful and intuitive experience. Creating a delightful experience is always important however research shows that in the domain of education, this is even more important as the affective component on learning has a direct impact on outcomes.